Building on the steps laid out in Scia Engineer 2013 released earlier this year, this release 2013.1 brings many updates to design codes (Eurocode, IBC, NBR), further improvements in the new Engineering Report and introduces the inter-storey drifts and accidental mass eccentricities for seismic analysis. All modifications related to member design since version 2005 of the AISC 360 standard have been taken into account, including the new checks for local buckling for T-stems in flexural compression and for torsional-flexural buckling for single angles. An important improvement is also related to the recommended analysis paths in the AISC 360-10. Scia Engineer 2013.1 enables the user to perform a rigorous structural analysis following the Direct Analysis Method, including considerations of the 2nd order deformations, initial imperfections, and plasticity. Our developers reorganized the input and output to provide a user interface that follows perfectly the flow of the Eurocode. Additional tables, values, descriptions of parameters, references to the code were added where needed, delivering the transparency where the user needs to be confident of the calculations. It’s now possible to design the longitudinal reinforcement of slabs to the Brazilian Standard NBR 6118. Several detailing provisions are taken into account, as well as the check of the concrete strut. Other design code improvements include: update to concrete beams & columns to NBR, several improvements to steel connection design to EN1993-1-8, new National annexes for 3D wind generation and support for the Swedish National Annex to EN1992. Introduced in Scia Engineer 2013, the brand new Engineering Report tool was further improved. The ChapterMaker now supports pictures. This means that indenting pictures under another item will automatically generate pictures in repeating sub-chapters. For example, in a few clicks you can generate pictures with all the loads, for each load case in the project! Another practical use is to generate results for each layer or load combination separately. The export to Word now supports the RTF format for a higher fidelity, especially for tables. Working with many pictures is more comfortable thanks to lower memory consumption and increased speed. The opening of a report has also been optimized. Based on the storeys defined in the project, the inter-storey drift is calculated for each mode, and the resulting modal superposition is available graphically and numerically. To properly take into account accidental mass eccentricities, two additional static load cases are created that include the corresponding torsional effects on the building. The distribution along the height can be linear, or according to a selected eigenmode. These “mass eccentricity” load cases can be easily included in the seismic combinations to fulfil the provisions of the code. 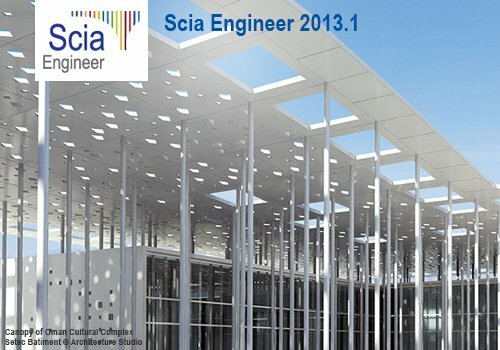 For a full list of all improvements, we invite you to visit the new section about Scia Engineer 2013.1 on our release website 2013.1.scia-engineer.com.